Captain Francis Chilalika, South Africa’s first black ship surveyor and since part of SAMSA senior management goes on retirement aged 65. At a formal low key yet highly significant event at SAMSA head office in Pretoria on Tuesday, and during which he was presented with an assortment of gifts along with his Long Service Certificate, Captain Chilalika bid a fond, emotional farewell to both management and staff of the organization, albeit, with a promise he would not be lost completely to the continent’s maritime sector. In his section of the operation, the Centre for Shipping, guided by no less than 10 pieces of national and international shipping and marine related legislation and conventions, Captain Chilalika’s responsibility lay broadly with overseeing SAMSA’s adherence to implementation of conduct of surveys of Ships docking at the country’s commercial ports from Saldanha in the west coast through to Richards Bay in the east coast. BIDDING FAREWELL: (From Left, seated) SAMSA Executive Head for Human Capital Ms Lesego Mashishi and Captain Francis listening attentively to tributes during the Captain’s farewell event at SAMSA head office in Pretoria this week. However precisely, as regional manager for SAMSA’s (North region) based in Pretoria, he was charged with providing strategic, operational and administrative leadership to SAMSA staff located in the regional office as well ports by ensuring among others; coordination of SAMSA business inclusive of adequate capacity to deliver services, provision of technical advice to industry, and effective communication between head office and port offices. In addition, Captain Chilalika – a holder of several post graduate qualifications in nautical sciences, marine law and business from universities and other higher education institutions in South Africa and abroad, including a Master’s Degree in Maritime Safety Administration from the Malmo, Sweden based World Maritime University – has also been South Africa’s representative on the International Maritime Organization (IMO) sub-committee on Flag State Implementation since 2002. Captain Chilalika also currently serves as the Field Authority (FA) and the National Authority (NA) charged with vetting port State control inspection reports from SAMSA Port State Control Officers (PSCOs) and their submission to the Secretariat of the Indian Ocean MOU on port State control (IOMOU) based in Goa, India. At this week’s farewell event, the 65 year old veteran and father of three; described his time in South Africa’s maritime sector as having been both a challenge, yet fulfilling with numerous rewards, but specifically his opportunity to contribute to the rebuilding of the country’s maritime economic sector through SAMSA. Captain Chilalika, a native of Lilongwe, Malawi and a naturalized South African blazed the trail by becoming the first black ship surveyor when he joined the Department of Transport’s then directorate for shipping in 1996. At the time, he’d had accumulated more than two decades of academic education, seafarer training and skills as well work experience in the maritime field, in the United Kingdom, Malawi, Kenya and Zimbabwe. With the establishment of SAMSA in 1998, Captain Chilalika moved to and became part of organization ever since, contributing both to its functionality and effectiveness as well as to safe management of shipping vessels in the country’s ports. Among his major contributions was the establishment of the first ever course for mariners and government officials on the modalities of ports State control – an educational aspect he says he will continue with into retirement. “My time in the Shipping Directorate and SAMSA has been amongst the best years of my working life,” said an emotional Captain Chilalika on Tuesday. He said: “As well as the skills and qualifications that I have gained along the way, I have gained something more important. I found and developed great friendships, some that will stay with me for many, many years to come. I have also gained a feeling of belonging, and enjoyment in the job that I have been doing. These were the real reasons that I enjoyed coming to work every day. “So finally, after 20 years, two at DoT and 18 at SAMSA I am going to shut up. But just before I do, I have a few thank-yous…firstly, to the people who have helped make me who I am by coaching, instructing, collaborating, asking questions and so on. And finally, a general thank you to everybody for making my time here so enjoyable,” he said. Paying tribute to Captain Chilalika, SAMSA Chief Operating Officer Mr Sobantu Tilayi heaped praise on both the veteran ship surveyor as well his native country, Malawi for a pioneering role in the Southern Africa Economic Development Community (SADEC) region in the development of maritime economy based skills among black people and which ultimately benefited even South Africa. Mr Tilayi attributed South Africa’s successful launch of a national cadet development programme by SAMSA on behalf of the South African government about half a decade ago partly to the example set by Malawi. He applauded Captain Chilaluka specific contribution to the setting up and successful development of SAMSA from 1998 as the main driving force behind efforts undergirding the rejuvenation and wholesale development of the country’s maritime economic sector now formerly pursued under Operation Phakisa (Ocean Economy). Mr Tilayi said relations between SAMSA and the Malawian government remained strong with commitments to continue engagement as well as assistance on matters of common interest. He said South Africa, the youngest of African democracies, owed it to the rest of the continent to continue engagement and contribution to socio economic development for the beneficiation of all its people. For Mr Sobantu’s further remarks click here. *A more comprehensive multimedia feature on the illustrious career of Captain Chilalika, South Africa’s black ship surveyor, will be shared on this and related platforms, soon. The removal of the wreck of the MV Smart coal carrier that ran aground and broke into three parts while loaded with tons of coal as well as fuel just off Richards Bay in the Indian Ocean in 2013, was successfully executed by Titan Salvage, now a part of Ardent following completion of the merger of Titan and Svitzer Salvage. Captain Nigel Campbell, executive head of SAMSA’ Centre for Ships and insurance firm, North of England P&I Association deputy global director (claims) Mike Salthouse; said this week that the removal of the vessel, registered with North’s by owners; Alpha Marine, has been accomplished successfully, on time and on budget, due to a high level of collaboration among various government and private sector operators including SAMSA, contractors Titan and North. They described the task of retrieving and removing the vessel in the last few months as especially challenging given weather conditions that prevail on the South African coast, especially during the winter period. 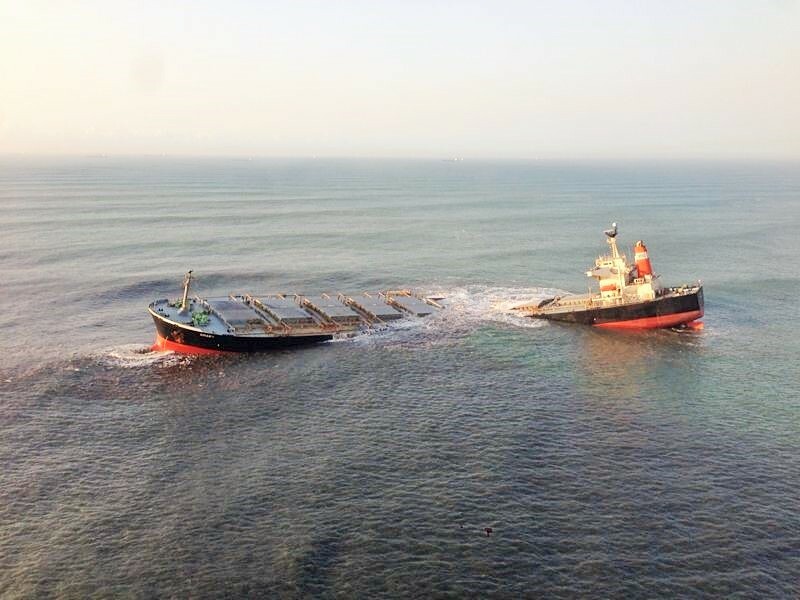 The team said retrieval and removal of the coal vessel began in 2013 almost immediately after the 151,279 DWT bulk carrier ran onto a sand bar on August 19 of that year, shortly after setting sail from Richards Bay coal terminal in a seven meter Indian Ocean swell. At the time of the incident, the 273 meter long ship with 23 crew members on board was carrying 147,650 tons of coal, 1,769 tons of fuel oil and 129 tons of diesel. With all crew members safely rescued, just a couple of days later, the vessel split into three parts. To manage the work, Dutch salvor Smit Salvage, part of Boskalis Westminster, Smit Amandla Marine and South African salvor Subtech Group were tasked with removing the fuel first. “This is always a consideration after ensuring the safety of the crew, which was achieved without spillage, followed by 10,000 tons of coal slurry in the ruptured No. 9 hold,” said Mr Lajmi. They then refloated the separated stern section and scuttled it offshore in October 2013. Titan Salvage was then then awarded responsibility to perform the lightening, refloating and scuttling of the partially buried bow section. The contract was this week described as unusual because of the extent to which Titan assumed the operational risks associated with the project, and in the process minimizing possible costs overrun. According to Captain Campbell, following to the successful retrieval of the stern section, a year later the bow section was also refloated and scuttled, with the remaining mid-section cut down and buried at the beginning of September 2015 and the rehabilitation of the seabed completed immediately thereafter. Commenting on the salvage work, Mr Salthouse said: “The successful removal of this very large, high profile wreck highlights the benefits that flow from an open and early dialogue with the authorities responsible for managing a wreck site as well as all other stakeholders. “The collaboration between North, SAMSA, the South African Department of Agriculture and Environmental Affairs, the Endangered Wildlife Trust, the international salvage team and the International Group of P&I Club’s reinsurers has provided clarity from the outset, enabling an accurate budget to be agreed and adhered to from an early stage. Captain Campbell was in agreement. He said: “The successful conclusion of the operation is a tribute to all parties, government departments, the local municipality, Transnet National Port Authority, insurers and salvors, who by working together as a team and reached agreement on sensitive issues through consensus without having to resort to the courts”. “It was important to SAMSA that the operation led to a skills transfer to South Africans, especially as operations of this magnitude are fortunately rare occurrences both internationally and domestically. “Nobody benefits from incidents of this nature but it has to be recognised that in excess of R420 million was spent in South Africa during the two years it took to reach completion,” he said. According to Mr Salthouse, under the International Group pooling agreement, North retains the first US$9 million of the cost and the balance is shared by the 13 clubs through various reinsurance arrangements. He also described it as an important success factor the well-managed transfer of risk to the salvors, such that the world’s shipowners and their reinsurers were not faced with cost escalation during the two-year project.